I would be remiss if I did not at least give a shout out for the very fabulous annual Turkey Trot in Prospect Park, hosted by Brooklyn’s own Prospect Park Track Club. The 5 mile race starts at 9 a.m. on Thanksgiving Day, this Thursday November 27. Registration the morning of is usually bearable, or go here for registration and more info. Also, a discussion on who’s running a Turkey Trot landed in my inbox via Runner’s World this morning. Check it out here to see the discussion and add your thoughts. At the very least, running a race the morning of Thanksgiving will make for some good discussion around the dinner table, especially among the non-runners in the family. 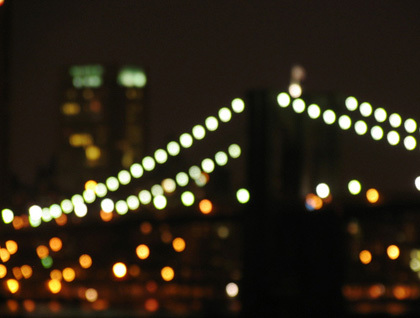 The other night I ran through Dumbo and across the bridge at night, like 10 o’clock. (I would never do this alone but since I was with another person I felt it was OK). What a treat it was to be on the bridge and above the water with the city all up in lights and the air cool and mild on your face. It’s a different city up there at night, quieter somehow but still full of life. Perhaps it was the colder weather, and how it gets darker earlier these days, but everything’s a bit more subdued. With the winter coming and the weather cooling the nights seem quieter now. The cold has always been one of my favorite times to run. Fewer people on the street. The stillness and hardness of the earth seem to make running a more solitary experience — more soulful somehow. On my evening run today I passed a pretty bad accident at a major intersection. Bad enough that the corner was cordoned off by yellow police tape and the street closed for two blocks on either side. As I passed the wreck you couldn’t help but slow down (gawk?) — the entire driver’s side of the car was sheared off. I hate imaging these accidents, how they happened, what must have happened to the people inside, and I never know quite what to do with the info once it’s sunken in and sobered you for a spell. Maybe it’s the realization that the seasons will change. The sticky heat of summer will give way to the cool crispness of fall. Maybe it was that one season in Philly that forever fixed it in my mind, maybe it’s just that the weather is so perfect for long runs, but for me fall will always feel like the season for long distance running. And I want to be ready.